Senior Director, Analytics, Framework LLC. Framework is a Stamford, CT and Seattle, WA-based analytics and advisory firm specializing in sustainable business practices. Headline-grabbing scandals continue to drive home the importance of public trust for the profitability and success of major global corporations. In nearly every industry, there are multi-national companies that have seen steep declines in shareholder value and a loss of executive leadership due to high-profile negligence or deceit. 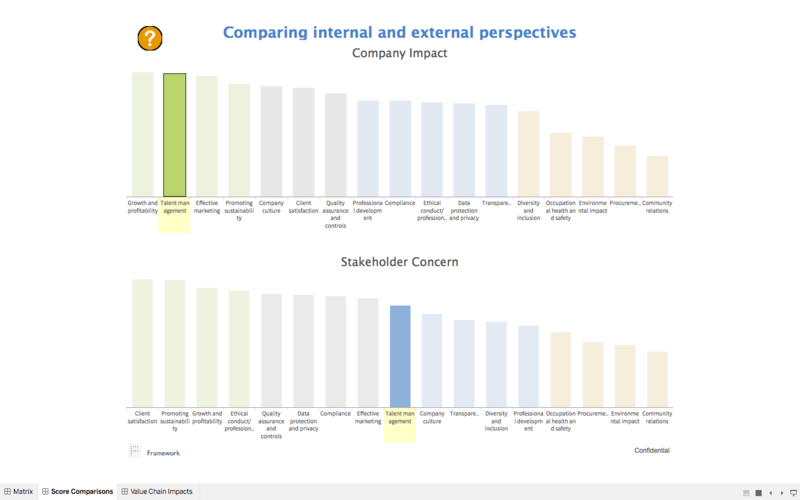 Companies are more commonly being asked to address questions about, among others, governance, consumption of energy and raw materials, equal opportunity practices, and greenhouse gas emissions—and their performance is impacting financial results, not just brand reputation. It’s important to understand and manage these risks and opportunities that were once deemed unrelated to business priorities, including a broad range of economic as well as environmental, social, and governance (ESG) factors. We call them “material” issues. Studies by Harvard Business School and other experts have shown the correlation between ESG management and long-term financial success. The evidence is convincing enough that major investors are placing more emphasis on them as indicators of strong management and strategic foresight. And for all involved, data is at the heart of understanding and strategic decision making from the C-suite to the production floor. 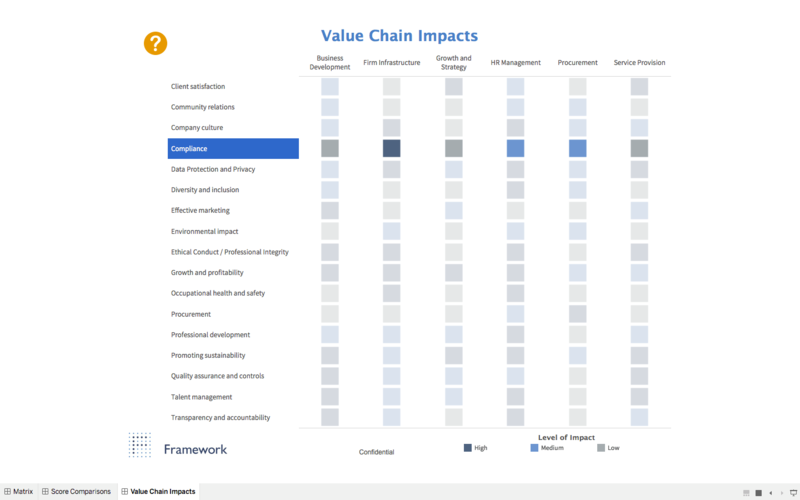 At Framework LLC, a consultancy focused on helping companies create value through sustainable practices, we believe in the power of data to drive both a more sustainable world—and a more comprehensive approach to corporate strategy. The two goals aren’t as unrelated as they might seem. To unlock the full value of sustainable business practices, of course, we first need to identify those particular social and environmental issues and behaviors that can help companies grow financially if managed well. We do this through a methodology known as materiality analysis. 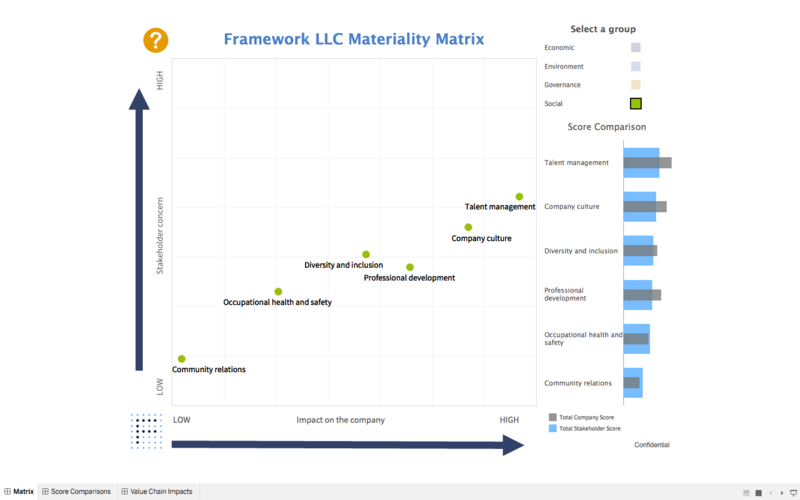 Framework is a recognized leader in materiality analysis, and we use Tableau as a key part of this work. We were among the first firms to develop a materiality methodology more than ten years ago and since then have conducted many analyses at the enterprise level, for individual business units, and for entire industries. Many Framework clients have consistently been recognized in national and global rankings of corporate citizenship and sustainability, and their firm understanding of their material issues is at the core of their strategies. The primary visualization in materiality analysis is a scatter plot matrix. In the research phase, we identify the universe of possible issues that can occur at each step of the company’s value chain. These may include, for example, occupational health and safety at the raw materials extraction stage; material waste in manufacturing; greenhouse gas emissions in logistics; diversity and equal opportunity in retail; or supporting healthy choices for consumers. Many of the issues we target for analysis are drawn from international frameworks for sustainability, such as the Global Reporting Initiative (GRI), the Sustainability Accounting Standards Board (SASB), and the United Nations Sustainable Development Goals (SDGs). To understand the issues that are most material to an organization, we study company, industry, and media documentation, and also consult stakeholders inside the company and in the larger operating environment. 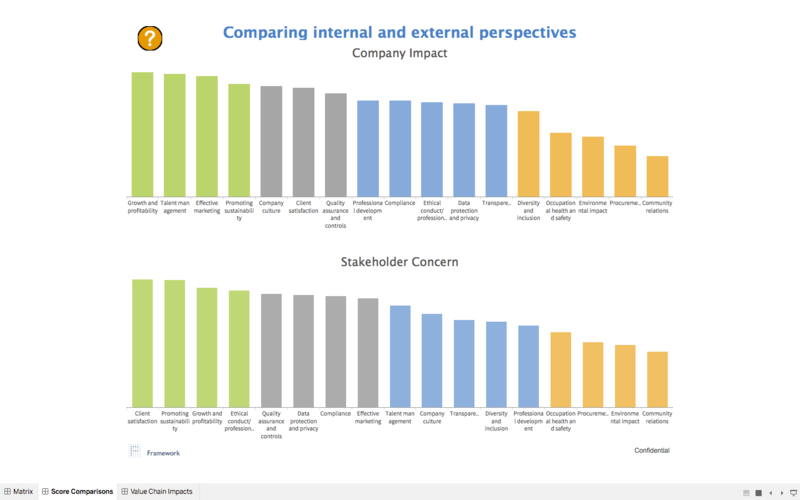 Impact on company success and the importance to each stakeholder group affect the score and weight of our findings, then we visualize the results by plotting the difference between internal and external perspectives. The Tableau platform helps us communicate these findings with clients. Interactive layers of data allow us to quickly pinpoint major issues and answer follow-on questions. In the examples that follow, we share results from an analysis we conducted on our own behalf. Not surprisingly, as a small business in the sustainability field, we find that economic issues such as “promoting sustainability,” “client satisfaction,” and “growth and profitability” are the most material to our success, ranking highly among both internal and external stakeholders. Findings are not always this obvious, of course. For example, materiality analysis we conducted and published for a large, multinational confectionary company around 2010 predicted that cocoa sourcing and consumer health would become major strategic issues due to concerns over child labor in key cocoa-growing regions and the amount of sugar and other ingredients present in their products, respectively. At the time, those topics were not considered core strategic issues in the industry or mainstream social discourse; however, within five years, the company and its peers had reprioritized sourcing practices to address labor questions and even reformulated their product portfolios to mitigate consumer health concerns. The latter factor is now driving acquisition and product development strategy in the snack industry. When working with clients, we’ve found incredible value in being able to drill down into subsets of data and focus on similar types of issues. We can select and review only social issues and see that most fall outside of the concern of external stakeholders, who may currently perceive them as well managed. Of course, a single event could change that perception. Data that reveals significant discrepancies or an evolution of perspectives over time present opportunities to ask questions. Are there shareholder concerns that need to be addressed internally? Are there stories about positive impacts that are not being told, resulting in missed opportunities for public trust? Are there intangible issues that constitute future risk, and may require a shift in strategy? What are we missing when we only look at the financial data? The matrix informs dialogue in establishing company-wide social and environmental strategies, as well as annual reporting to international bodies on sustainable development. As we investigate these questions, we can arrange the data differently and drill down to greater levels of precision. For example, in a graph we affectionately call the “piano keys,” we re-group the issues by relative materiality score rather than by type. This type of benchmarking gives an instant read on the difference in perspectives. Here, talent management ranks at the top for the company internally, but is two groups lower in importance for external stakeholders who see client satisfaction as the highest priority. Building from this, we might start asking how to balance the perception between these two factors, and how they might be interrelated. 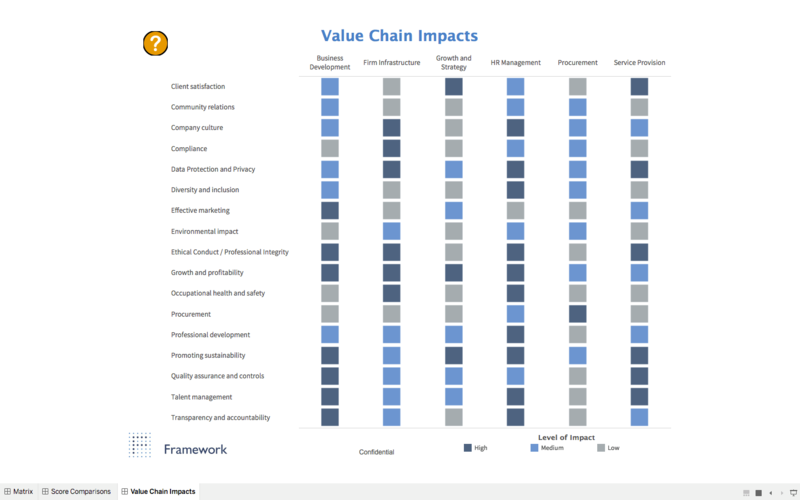 On the internal side, we also pinpoint the relative materiality of each factor across each step of the value chain. Below, compliance with regulatory frameworks is seen as important at the firm infrastructure stage, but of lesser importance at the growth and strategy stage; in our particular business, so long as it remains well managed, it does not need to factor into our strategic planning and evaluation of opportunities. A 2016 study we conducted found that approximately 41 percent of S&P 500 companies surveyed had conducted a materiality analysis within the prior three years, indicating that this is an increasingly common practice, though its tipping point remains ahead. As materiality analysis continues to be included in mainstream corporate strategy, it is likely to increase opportunity and reducing risk for companies that heed its findings. In fact, at some companies it is being integrated with more traditional risk management processes and receiving careful consideration from the C-suite, with positive results. For example, CVS Health has made a number of significant decisions in recent years that align closely with their materiality analysis findings. In eliminating tobacco product sales (aligned with consumer health) and quite recently, taking a leadership position against retouched images on beauty products (aligned with packaging transparency), they have strengthened customer trust, enhanced their brand, and created competitive advantages that are having real financial benefits. As more companies discover the power of ESG data and analysis through materiality, we look forward to the day when business success and social benefit are universally recognized as natural counterparts, rather than opposed priorities. Looking for the signposts to that convergence? They are all right there in the dashboard. 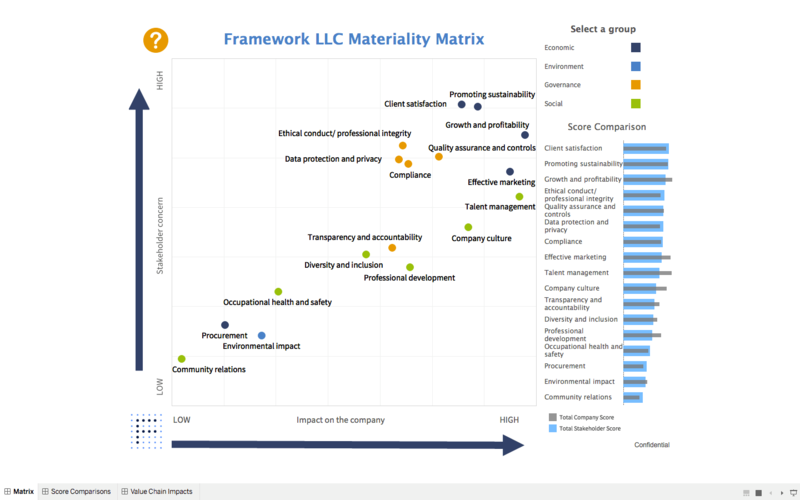 You can read more about Framework’s materiality analysis approach on the company’s website.